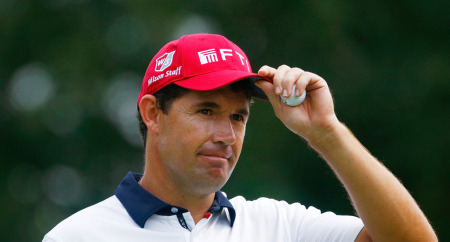 Injured Harrington misses BMW PGA but vows: "I will definitely be there for the US Open. I will play on a crutch if I have to." Padraig Harrington in action at Wentworth last year. Credit: golffile.ieFirst he was disqualified in Abu Dhabi. Then he ricked his neck warming up for the first round of the Masters and missed the cut. Now Padraig Harrington will miss next week’s BMW PGA and will have been out of action nursing a hamstring tear and subsequent knee problems for up to three weeks before he heads to the St Jude Classic in Memphis for his US Open warm up. Whatever about his swing changes, his mental gremlins and his advancing years (he’s 40 in August), the world No 43 has been incredibly unfortunate this season and the end result could see him head to Congressional Country Club for the second major of the season, ranked outside the top 50 in the world for the first time since April 2000. Whatever his progress, Harrington has vowed that he will be in Washington DC for the US Open come what may. “I will play on a crutch if I have to,” he said yesterday. It was obvious following his second round 78 in The Players Championship that the Dubliner was struggling badly to cope with his latest injury and its effect on the right knee that needed keyhole surgery to clean out some cartilage debris just under a year ago. This time Harrington has been warned that if he doesn’t allow his hamstring some time to heal, he runs the risk of doing himself future damage. As a result he misses next week’s flagship BMW Championship at Wentworth, though he will be there during the week for the European Tour’s annual dinner and at nearby Sunningdale on Tuesday to give a junior clinic in his ambassadorial role for the R and A. For a man who has made just two of the last six cuts, the news of his withdrawal from next week’s event in Wentworth is a huge blow. “It was a a small problem that happened three weeks ago,” he said. “I had a small tear in a hamstring and then it inflamed the popliteus underneanth my knee at the top of my calf which meant the stabilty in my knee went. Harrington had treatment at Sawgrass and again with Alan Kelly in Tallaght on his return from the US. He added: “It was only a minor, minor one but I didn’t really pay much attention to it when it happened and it wasn’t affecting my golf to start off with. But then when I twisted it on the golf course, the stability had gone and it was a kid of acute pain. “To be honest, you could strap it up and I could live with it. I lived with it last week and I could avoid it on certain shots. As long as I don’t get on slopes I am okay. But obviously there are a lot of slopes on a golf course. “I could get away with it but If I don’t stop now, it is just going to get worse. I will definitely be there for the US Open. I will play on a crutch if I have to. For a man who has worked hard on his fitness to extend his career deep into his 40s and has changed his swing to take the stress off his body, this is not good news. Whether or not his physcial breakdowns are caused by age and years of physical self-abuse or simply a blip on the radar remains to be seen. Harrington certainly won’t be seen on a golf course in a competitive role until the St Jude Classic in two weeks’ time. Elvis awaits but it remains to be seen if Harrington will be ready to rock and roll by then. Padraig Harrington is hoping that new greens at Wentworth will boost his hopes of ending Ireland’s 52-year wait for a victory in the British PGA. The triple major winner will get a sneak preview of Ernie Els’ radically revamped West Course when he tees it up there on Tuesday in a company day for club sponsors Wilson. Padraig Harrington can’t wait to attack new-look Wentworth in next month’s BMW PGA Championship. The Dubliner hasn’t played in the European Tour’s flagship event for the past two years because he hates putting on the West Course’s bumpy greens in May. Padraig Harrington admits he’ll be under pressure to perform when he makes his Wentworth return in this week’s BMW PGA. Harrington keeps the stress off his right knee during last year’s Irish Open. Credit: golffile.iePadraig Harrington is battling to be fit for next week’s BMW PGA at Wentworth. The Dubliner, 39, tweaked a hamstring playing with his children before heading to the US for the Wells Fargo Championship two weeks ago. The injury put pressure on Harrington’s right knee, operated on nearly 12 months ago to repair a cartilage tear. As a result, Harrington immediately sought medical treatment on Monday and will spend the next week in cotton wool as he counts down to Wentworth and next month’s US Open at Congressional. Padraig Harrington at Celtic Manor last year. Picture Eoin Clarke/www.golffile.iePadraig Harrington’s Ryder Cup future could be in danger as he continues his world rankings freefall. The five-time Ryder Cup star, 39, is about to slip out of the world’s top 50 as he sits out this week’s BMW PGA with a knee injury. The former world No 3 has crashed 25 places to 48th in the world this year and will slip further as he takes the next two weeks off to recover. And if he fails to win before the end of October he could miss the $7 million HSBC Champions and give his Ryder Cup rivals an early lead in the race to make Jose Maria Olazabal’s 2012 team.